From the author: The six Herdman children are the terror of their town. 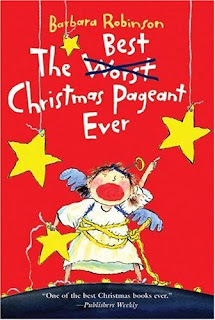 When they take over the annual Christmas pageant, everyone rediscovers the true meaning of Christmas. So I know that it is not Christmas. But whenever I think about a throwback, this book comes to mind. I remember reading this book over and over as a child. It is such a cute book. It is probably one of my favorite books ever. This book had me in stitches. It also has a movie, and it goes perfectly with the book. It is probably the only movie I've ever seen that goes perfectly along with the book. This book is great when you need to laugh or smile. I love, love, love this book so much. You guys should read it.